All of ZOLL's OneStep™ Resuscitation Electrodes incorporate features that speed defibrillation, ensure code-readiness, and simplify resuscitation. Choose the OneStep Resuscitation Electrode that best meets your need: OneStep Basic, OneStep Pacing, OneStep CPR Resuscitation (anterior-anterior or anterior-posterior placement), OneStep Complete, or OneStep Pediatric. A built-in CPR sensor enables Real CPR Help®, which coaches on proper rate and depth during CPR. After the code, simply dispose of the entire electrode to avoid patient–to–patient contamination. A Code-Ready® connector to allow electrodes to be pre-connected to the defibrillator without opening the packaging; no need to disconnect during daily defibrillator testing–it will test right through the electrode. An expiration alert enables the defibrillator to automatically issue an alert when the electrode approaches the expiration date. OneStep Pacing integrates ECG electrodes into the anterior defibrillator electrode, eliminating the need for a separate ECG cable. 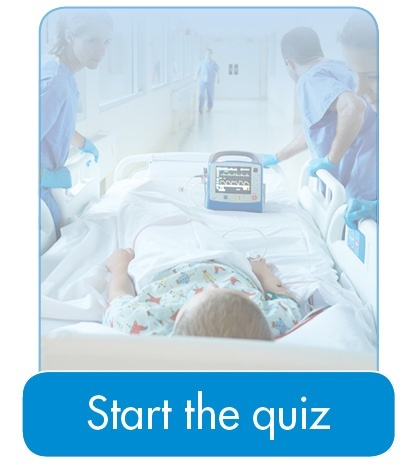 With ZOLL’s unique OneStep Pediatric CPR Electrodes, caregivers receive information that shows the actual depth and rate of compressions as they are delivered. When used with the R Series® defibrillator, CPR Dashboard™ displays this data on the screen. In addition, when used in conjunction with the R Series, the energy setting is automatically lowered to 50 joules. OneStep Pediatric Electrodes employ a unique pediatric algorithm that reduces the likelihood that a compensating rhythm will be terminated and ensures any unique pediatric ECG morphology will be accurately identified when a shock or cardioversion is indicated. OneStep Pediatric Electrodes are available with or without a CPR sensor. Radiolucent Pro-padz provide an unobstructed view of the coronary arteries on x-rays. Available in solid and liquid gel options and in adult and pediatric sizes. Liquid gel is ideal for procedures such as Cardioversion or long-term pacing; the liquid gel provides better skin coupling and less skin irritation. Sterile Multi-Function Electrodes are the only multi-function defibrillator electrodes available in a unique two-pouch system that allows placement of the posterior electrode prior to surgery and is optimal for use in the operating room. They are also available with 10-foot (3-meter) lead wire. The integrated handle and paddle combination, reduces the need for assembly. Available in two styles–with or without a discharge button located on the handle. Select various sizes for adult to pediatric patients. Available in two styles–with or without a discharge button located on the handle. Made of polished, surgical-quality stainless steel, these paddles are overmolded with durable plastic. Various sizes available. The growing interest in minimally invasive procedures challenges conventional means for defibrillating in the OR. Using electrodes is not always feasible. When paddles are required and sterility is an issue, the external paddles can be autoclaved quickly in the OR because they are made of a durable plastic that can tolerate high heat.